The basic design of a tipi or pyramid-style tent has been around for millennia. For good reason: they are easy to set up, remarkably durable, and use space efficiently. For centuries nomadic people around the world have used the tipi or pyramid style shelters. Their widespread use by North American Indians, especially on the Great Plains, is well known. Their use (even today) by nomads in Central Asia is lesser known. 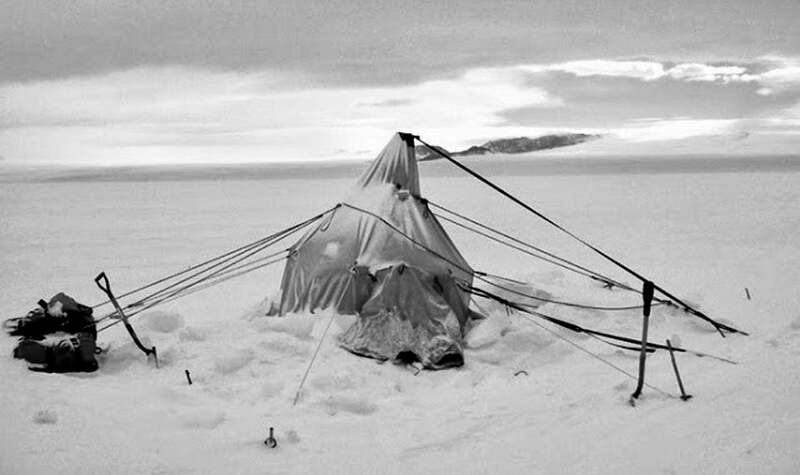 For more than a century a variation of this basic tipi design has been used for polar expeditions especially in Antarctica. Known as the Polar Pyramid or “Scott Tent” these tents have proven incredibly sturdy structures designed to withstand winds in excess of 120 miles per hour. Like the traditional tipi, the Polar Pyramid has multiple poles along the walls. Unlike the cylindrical Indian tipi, the Polar Pyramid has a square foot print that requires only four poles—one for each corner. In 1983 Chouinard Equipment created the 2-person Chouinard Pyramid Tent for skiers, backpackers, climbers, paddlers and other weight conscious backcountry enthusiasts. To save significant bulk and weight the Chouinard Pyramid utilized a single center pole. In 2013, Hyperlite Mountain Gear introduced an ultralight pyramid shelter made from Dyneema (formerly known as cuben fiber)–a non-woven, laminated fabric made by sandwiching Dyneema polyethylene fiber filaments between thin outer layers of polyester film. Hyperlite Mountain Gear improved upon the simple time-tested pyramid tent design by, among other things, enlarging it and adding tie-on points to three of the walls. The UltaMid 2-Person weighs just 1.04 pounds (16.6oz/471g), provides 63 square feet and costs $695. The company recently launched two varieties of mesh inserts–with a Cuben Fiber floor and with a skirt. The UltaMid 4-person weighs 1.3 pounds (20.8oz/590g), provides 85 square feet of living space, and costs $850. Mids are dryer than floored tents; mids ventilate better and moisture is absorbed into the ground not your sleeping bag. A lightweight ground cloth is recommended. Mids are safer: good ventilation and a high peaked ceiling create a relatively safe place to cook without worrying about asphyxiating or melting a hole through the ceiling or floor. Mids are light and spacious: with no floor, single walls and no extra poles, mids can weigh as little as a pound. And there’s plenty of room to spread out gear and even stand up. Mids are 4-season tents: set up properly mid shelters can handle snow, wind and rain. Unlike other 4-season shelters designed for winter conditions, mids do not overheat during warm summer weather. Sometimes you get lucky when erecting a pyramid tent–secure the top of the shelter to a tree branch and no center pole is needed. More often trekking poles, ski poles or paddles are used. With larger mids, however, this does require fastening two poles or paddles together. In the summer I rely on large rocks and logs to anchor my mid, and in the winter I anchor skis, poles or branches into the snow. I start with the four corners secured in a perfect square. Next I insert a center pole and adjust its length as needed. And finally, if required, secure additional guidelines and berm the edges with snow. The first time setting up a mid can be confusing. Yet, with a little practice you can learn to set one up in just a few minutes and enjoy the wonders of mid-life. Read our interview with Forrest, or check out his blog report on Tasmania’s Overland Track. The post Mid-Life Is Wonderful: Pyramid Tent History appeared first on Hyperlite Mountain Gear Blog.